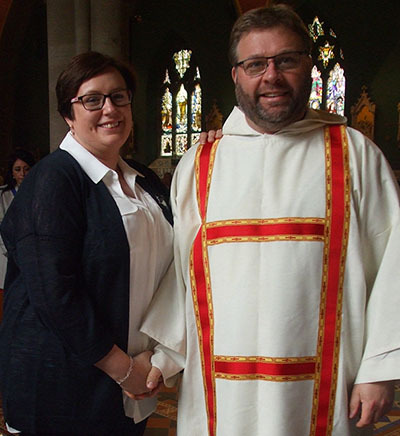 Martin Bell with wife Lindsey at his ordination in Cathedral on the 18 June 2016. Martin is deacon at St. Mary’s, Hexham and also works along with Lindsey, in facilitating RCIA and Marriage Preparation in his Partnership (Heavenfield). His full time Job is a Business Manager of a GP Surgery. I’d spent many a year trying to resist the Lord’s call to the deaconate, and I was sure I’d be found wanting during formation and be shown the exit; but no. The first few weeks after ordination, I was a little uncomfortable, feeling like ‘liturgical window-dressing’, unsure of the role I was to fulfil. Nigh on two years later, I am still not 100% sure of the role I fulfil as a deacon, and that’s wonderful. I’m not ‘the finished product’, and I hope I never will be; for the day I stop learning is the day I should retire! What does it mean to be a deacon? I’m still the same person I was before ordination. I’m still, first and foremost, a husband and a dad. I still work. I still have doubts and questions; I still struggle with my faith; the church; and my prayer life is far from perfect. I’m still me. Yes, I’m up on the sanctuary, and I do miss sitting with my wife and children in the pew. Yet there is something different; but it feels right. It is right because I know I still have their love and support to keep me grounded. Deacons are servants in the image of Jesus, in three ways particularly: as ministers of the word, at the altar and in charity. What do these actually mean to me? I recall a brother deacon saying that he felt proclaiming the Gospel to be a really powerful moment. I agree: it is. Standing up there and sharing the Good News of Jesus is an honour. Preaching is the scariest privilege of my life. Breaking open the Word of God and trying to make it real and relevant is a challenge; I know I need to receive and live the Gospel as equally as those sitting in front of me. Being part of the liturgical life of the church is amazing. I’m experiencing something different with regards to the Eucharist. I can’t explain what it is, but being up there next to the priest, seeing it from a different angle, so to speak, is helping me to re-discover and re-examine the importance of the Eucharist in my life. Being the church’s minister at baptisms, weddings and funerals is a great privilege: opportunities to simply tell people that they are loved by God, that they mean the world to him, and that they can walk with him all the days of their lives, here and for eternity. The area where I am struggling to get fully to grips with, in my ministry as a deacon, is the ‘so what now?’ bit of it. I’m more comfortable with the ‘church’ aspects of being a deacon, but being a deacon – for me – means that I don’t live out my ministry in the church: I am to take Good News, the faith, out of the church building into the community, walking with and alongside the people of the parish, the partnership, and the community. I am truly to be their servant. I’m not there, yet. I’m still teasing that aspect of my ministry out. At my ordination, I received a greetings card with the picture of an open door on it. The meaning is clear. By becoming a deacon, Jesus opened an additional door for me to walk through. By becoming a deacon, I find ‘doors’ opening for me. People invite you into their lives in new and deeper ways. I am invited to be a part of the joys and hopes, sorrows and anxieties, and the suffering of people. All I can do at times is just be there and listen. I’ve found myself on both the Diocesan Council of Deacons and the National Deacons Executive Committee. I still think at times “Lord, what have I allowed you to do to me?” However, I’m learning that with the Lord resistance is futile, and I’m slowly learning to trust that he’ll point me in the direction of the right doors to walk through.